"The basic classic: bacon, lettuce, and tomato -- nothing fancy, just delicious. (I personally use fake vegetarian bacon these days, and it's still really good!)" Cook the bacon in a large, deep skillet over medium-high heat until evenly browned, about 10 minutes. Drain the bacon slices on a paper towel-lined plate. 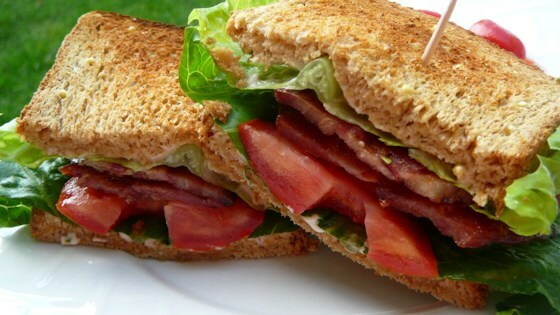 Arrange the cooked bacon, lettuce, and tomato slices on one slice of bread. Spread one side of remaining bread slice with the mayonnaise. Bring the two pieces together to make a sandwich. Blow off the bread and turn a classic sandwich into the perfect pasta dish. A blt without a slice of onion is just a waste of appetite. Add onion and this goes to a 5 star sandwich! I add salt and pepper to the tomato before closing the sandwich, and put mayo on both pieces of bread. Easy and delicious. A staple in the south. BLT's are the best. I love to add avacado to mine! YUMM!! !